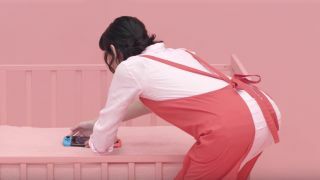 Remember 1-2 Switch, the new party game that’s launching on the Nintendo Switch in March? It was announced in Nintendo’s global Switch unveiling video in early January and focused on two people dressed up like cowboys using the wireless JoyCon controllers as pistols in a wild west style shootout. Nintendo followed the showdown with a lot of interesting footage of the game but, apparently, it saved the weirdest stuff for today. A Redditor uncovered treasure trove of awful-slash-awesome trailers on Nintendo’s Japanese YouTube channel where you can now find gameplay for 10 new mini-games including “Milk”, “Telephone”, “Samurai”, “Copy Dance” and “Baby”. Of the lot, the one getting the most attention is Baby, which uses the Nintendo Switch’s screen to display a crying baby who you can attempt to coddle. Pro tip: there’s no winning the child over, and you are subjected to a crying baby until you give up and throw your Switch out the nearest window. Each game has a unique gimmick like trying to catch a virtual blade between your hands, or playing a soda bottle version of the childhood game hot potato. I’m not sure why anyone would want to show off their JoyCon shaking skills in front of friends and family, but hey, every family is different I guess. Joking aside, it’s clear why Nintendo didn’t use Shaver or Milk for its big Switch presentation – it’d look like a bunch of certifiably insane people run the company. Still, that’s not to say these games aren’t totally unwanted. Strange titles have sometimes really hit home with Nintendo’s core audience – take Elite Beat Agents or the Warioware franchise, for instance. Considering that there are 27 of these strange, wonderful and sometimes quite awful mini-games loaded onto each 1-2 Switch cartridge, we can’t wait else the final version of the game has in store.